Volkswagen had a hard time convincing Americans that an über sedan was what they needed, thus the beloved Phaeton was considered a flop here. The Chinese-only Volkswagen Phideon won’t have that problem. Nearly as long as an A8 and built on the same platform, it is premiere in a country that still respects the concept. It’s common lore that Chinese execs and government officials have to get a vehicle slightly nicer than their direct report and not quite as nice as their supervisor. It’s how you end up with cars like the A4 L, which is bigger than an A4 but not as big as an A6, which itself is not as big as an A6 L, which is also smaller than an A8, which cowers before the CEO-level A8 L. You get all that? Moving on. An Audi is luxury, however, and that kind of consumption has become increasingly conspicuous in Xi Jinping’s China. If you’ve worked hard all your life, followed the party, and made the right friends and enemies it makes sense to expect a little something. The five-meter-long executive Phideon, then, fits the bill. While it isn’t technically a Phaeton, it’s a perfect model for what the Phaeton will become when it becomes whatever it is to become. 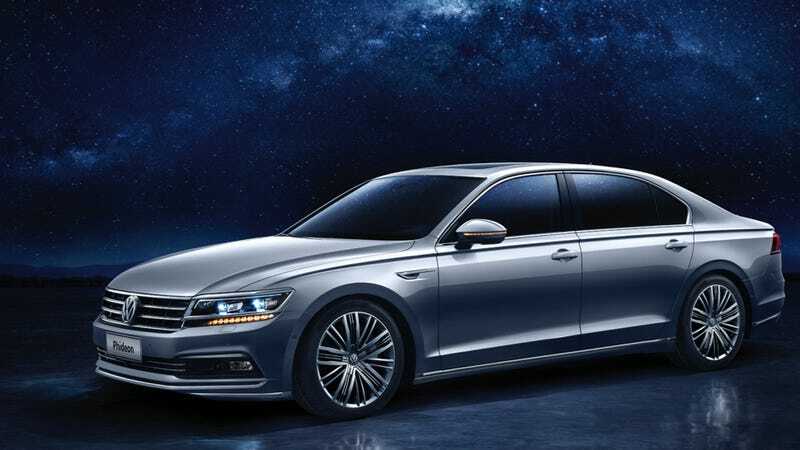 As the first Volkswagen on the MLB platform (currently shared with, in no particular order: the Macan, the A8, the A4, the A6, and the Audi Q5), the biggest VW approaches Phaeton-level of luxury with massaging seats, ambient light strips, and an air-suspension. Because it’s a big market, the car can be had either with a 3.0-liter turbo V6 good for around 300 horsepower in AWD trim or a less powerful front-wheel-drive model with a 2.0-liter four-cylinder. They expect to build a plug-in model. Also, it looks ready to bowl over buyers from Tiananmen to Hong Kong.